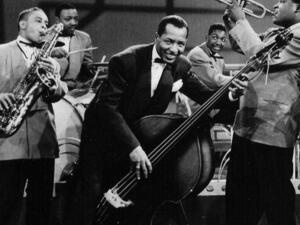 Filmmaker Mark Cantor explores four themes in jazz, with each new theme beginning on the hour. His archive of more than 12,000 films and clips of jazz and blues performances is widely considered one of the world’s premier collections of American music on film. Cantor screens rare clips and shares commentary with time for Q & A. 7 PM: Giants of Jazz, which surveys the music’s amazing diversity, trom the music of New Orleans to the big bands, from small combos to solo pianists. Among the artists to be featured on screen are Duke Ellington, Louis Armstrong, Bill Evans, the International Sweethearts of Rhythm, Thelonious Monk, Stan Kenton, and others. 8 PM: The Jazz Vocalist, which celebrates the voice as the "first instrument." This hour features performances by Billie Holiday, Ella Fitzgerald, Abbey Lincoln, June Christy, Mel Torme, Lambert, Hendricks & Ross, and many others. 9 PM: Jazz Dance. Up until the advent of bebop, jazz was basically music for dance, either social dance for the jitterbugs, or performance dance for an attentive audience. This program shows amazing dance performances featuring Whitey's Lindy Hoppers, Bill "Bojangles" Robinson, The Berry Brothers, "Peg Leg" Bates, "Snakehips" Tucker and others. 10 PM: Combos Big and Small pays tribute to great ensembles through the ages and featuring the music of Charlie Parker, the Savoy Sultans, Lee Konitz, Benny Goodman, Marian McPartland, the Art Ensemble of Chicago and a number of other seminal jazz combos.